Mrs. Craig’s Marketing and Law class recently held their PM Apprentice contest. As part of the hands-on lesson the class was split into four teams. The teams must come up with a product idea, develop an extensive business plan to secure start-up funds from a panel of bankers, develop a plan to market their product and then try to outsell the other teams during lunches at the high school for a 5 day period. The teams were also permitted to sell one day at the middle schools, if they desired. The teams competing this semester offered very different products – milk shakes, popcorn and candy, puppy chow, and deep fried Oreos. 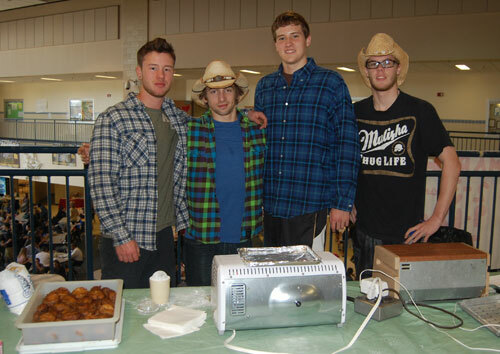 Country Fried Fellas, who offered deep fried Oreos, won the competition making a profit of $520.82. Team members pictured from left to right are Austin Richwine, Kevin Holton, Steven Armstrong and Braden Kruger. Two team members, Brad Snyder and Bo Perez, were on the “selling floor” and absent from the photo. Each of the four teams made a profit during the PM Apprentice week. The teams donate a percentage of their profits to the Penn Manor Education Foundation who provided investment funding for the “Apprentice Bank.” The remainder of the profits are split among the team members.